The QUICK 6-Section Standard Clamp Carrier is our most affordable Clamp Carrier, and is the woodworking industry's lowest-cost full-featured Clamp Carrier. 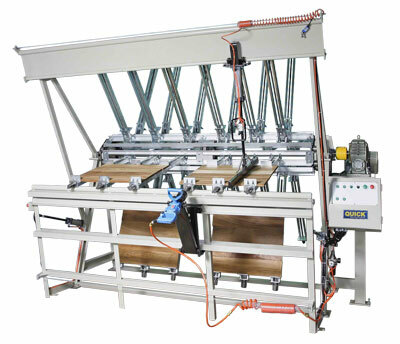 Capable of producing 144 edge-glued panels per shift (3 panels per section x 6 sections x 8 hours), the 8.5' wide, 6-Section Standard Clamp Carrier is ideal for the smaller cabinet or furniture shop. 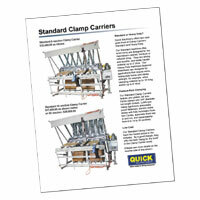 The 6-Section Standard Clamp Carrier can be expanded to 14 or 20 sections at a later date, if desired. 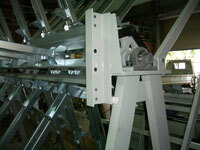 To view a high-resolution photograph of an 8.5' wide, 6-Section Clamp Carrier, please click on the image to the left. Our 6-Section Standard Clamp Carrier has a sturdy frame, with cast iron sprockets, 2" diameter main shaft and rectangular steel tubing legs. 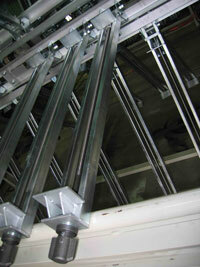 Standard frame width (maximum stock length capacity) is 8.5'. 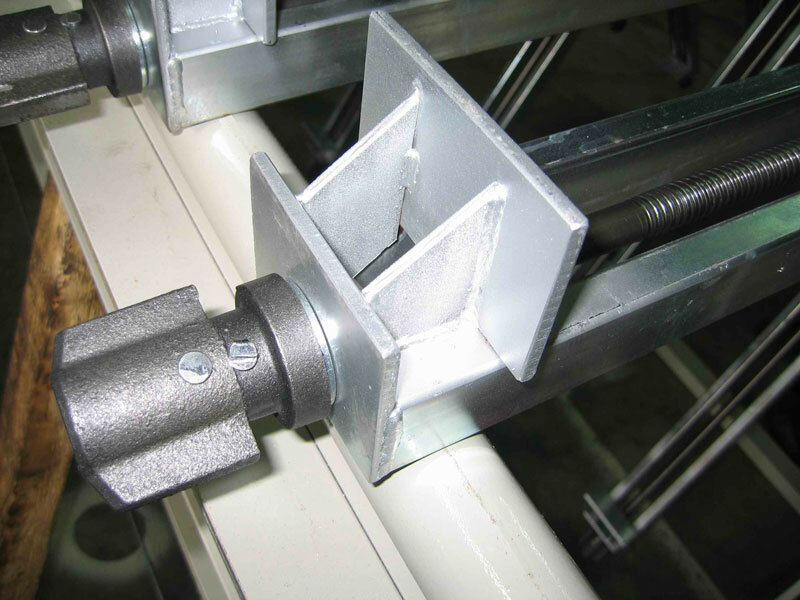 To view high-resolution photographs of a 6-Section Standard Clamp Carrier frame, please click on the images to the left. 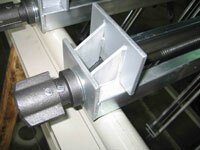 The 6-section Standard Clamp Carrier uses our super-strong Standard clamps, with 4-3/4" wide by 2-1/2" high jaws. The clamps are made of corrosion-resistant zinc-plated steel, and feature full box-frame construction. The full-length screws are a beefy 3/4" inches in diameter. 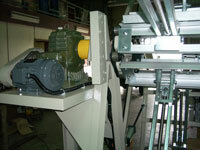 Standard clamp opening is 38"; other clamp lengths are available. 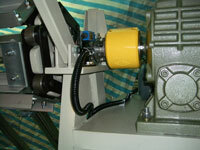 For face gluing, Rocking Plates, which extend the heights of the front and rear clamp jaws, are available, if needed. 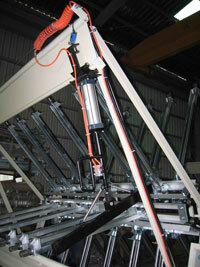 To view high-resolution photographs of our Standard clamps, please click on the images to the left. 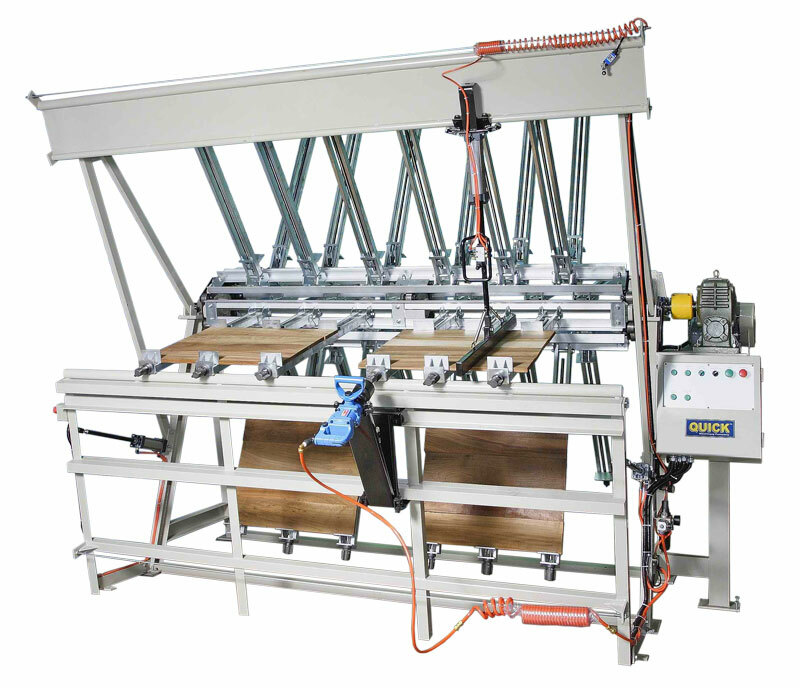 Amazing for a machine in this price range, the QUICK 6-section Standard Clamp Carrier features all of the high-production accessories of our larger machines, including Pneumatic Clamp Tightener, Pneumatic Panel Flattener and Electric Motor Drive with Automatic Rotation Cycle. 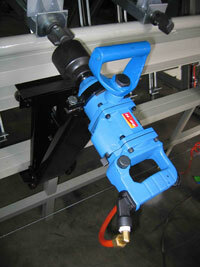 The Clamp Tightener is a super-fast, 3500 RPM unit. The two-handed design is much more confidence-inspiring than the ergonomically awkward swing-style clamp tighteners offered by other manufacturers. The unit is extraordinarily fast, too; easily five to ten times faster than competing units. 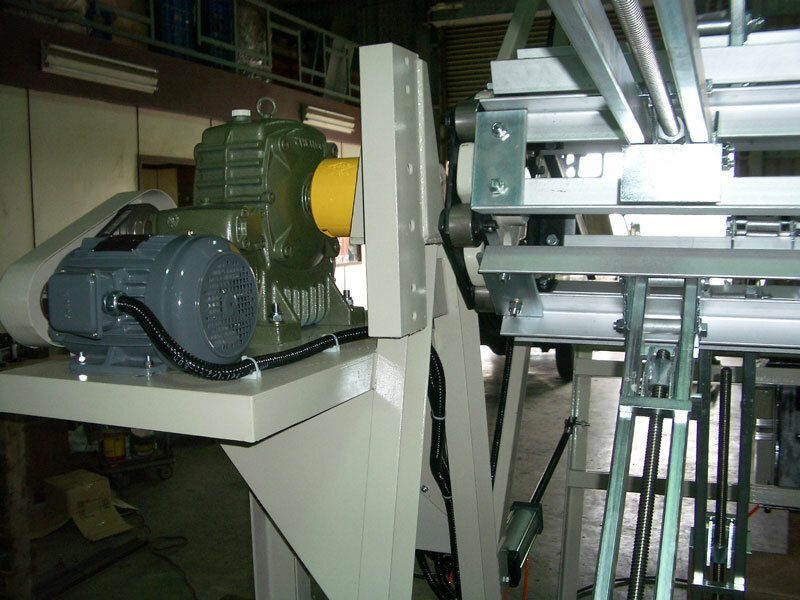 This enables all rear jaw adjustment to be made by the Clamp Tightener alone, without the need for separate manual rear jaw adjustment. 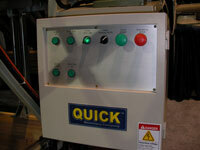 The Panel Flattener is an easy-to-use unit that slides easily from side to side on ball bearings. 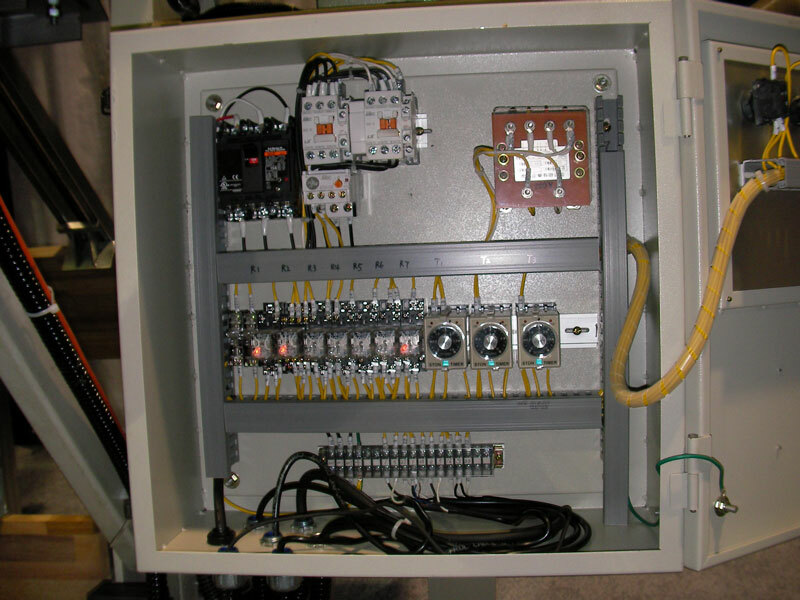 The Panel Flattener exerts up to 700 (adjustable via separate air pressure regulator, included) pounds of downward force, easily flattening panels as the clamps are tightened. 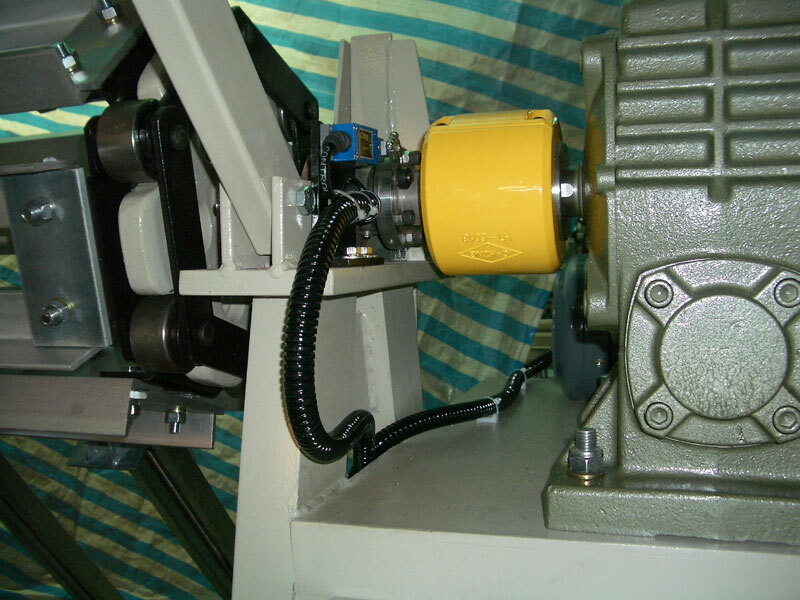 The Electric Motor Drive with Automatic Rotation Cycle on our 6-section Clamp Carrier is a marvel of engineering, especially for a machine in this price range. With the press of one button, the entire rotation sequence (reverse rotate, front rest out, forward rotate, front rest in, lay clamps perfectly on front rest every time) happens automatically. This is a huge improvement over competing machines, which typically don't even have air cylinders controlling the front rest, nor any electrical systems at all, let alone fully automatic rotation systems. To view a movie of our 6-Section Standard Clamp Carrier in operation, please click on the image to the left. To view a movie of our Standard Clamp Tightener Speed Demo, please click on the image to the left. 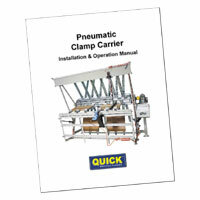 To download a PDF version of a QUICK Standard 6-Section Clamp Carrier Installation/Operation manual, please visit our Manuals page by clicking on the image to the left.